This is, I’d say the most general misconception, which has no founding in any statistic or fact. It probably has something to do with the past political demonization of the Serbian people in western media, who were pictured like bad guys holding knives in their mouths and roasting babies, which has, of course, nothing to do with reality. This is not something you have to take my word for, it’s enough just to ask ANYONE who has actually been in Serbia recently, and was simply blown away by the hospitality he received and the traditions of the people he met. Even official recommendations of western governments do not support this myth, and classify Serbia among the safest countries of Europe, in the same risk category like any western EU country. For example http://travel.gc.ca/travelling/advisories (click on the interactive map for a quick comparison of Serbia to other countries) – the data is updated regularly, so all recent developments are taken into consideration. This is actually one of the funniest questions I regularly receive, and the source of it can be only complete ignorance about the wars in the Balkans in the 1990s. A risk of landmines can only exist in the territories where wars were actually taking place, and there were NO WARS IN SERBIA IN THE 90S. The wars were taking place on the territories of Bosnia and Croatia, so in those neighbouring countries there are certain areas that still pose a mine risk (but all well marked, and known), but NONE whatsoever in Serbia! The only war activities that were taking place in Serbia was the NATO bombing campaign in 1999, which was largely concentrated on the positions of Serbian troups in Kosovo. So after that a certain risk of unexploded cluster bombs remained only in the bordering area with Kosovo, but even that has been cleared in recent years. Anyway, we’re NOT conducting our 4×4 tours in Kosovo or anywhere near affected military installations, so the “risk” of landmines in our tours is a clean 0%, just as it would be in Romania, Bulgaria or Greece. The migrant crisis is a considerable risk, isn’t it? Again, this is media inducted hype, which has no foundation in reality. The dramatic images from the borders shown in TV, with the police clashing with the migrants make one feel uneasy, but the media simply have to put things out of proportion to gain their ratings. Yes, Serbia is the country that most migrants pass through on their way to western Europe, and there is a considerable number of them in the refugee camps and on the borders, but the vast majority of those people travel along main roads, and cross borders near official border crossings. High up in the mountains where we conduct our tours there’s almost no chance of meeting any of them. Besides, 99% of those people are unarmed, and friendly, so there’s no risk of harm coming from them, either while moving, or camping. So to put things short, I’d say the answer to the question above is NO. What about the prohibited areas? What about the health risks? Should I use water filters? Serbian mountain springs are among the cleanest in Europe, and you can safely drink the water from them as it is, without additional filtering or decontamination. There are no diseases you have to fear while moving through the wilderness, and no vaccination precautions in effect – it’s a European country, with a 100% European ecosystem. Should I fear wild animals while camping? No, you shouldn’t. You’re not in Africa or Asia, so there are no big, dangerous predators here. Serbia actually has a big population of wolves (which is rapidly increasing due to the human depopulation of the rural areas), and also a small number of bears (most of which are concentrated in the Tara national park), but none of them are a threat to humans camping in the wild. All wild animals in Serbia fear humans, considering them to be the most dangerous predator of all (which is actually true). In fact, the further in the wilderness you choose your camping spot, the safer you are! Who’s going to travel all the way there? It would take ages! Are you sure? With only about 1000 km from Germany, and much less from Austria or Italy, on modern highways (which exist either through Hungary or Croatia) you’ll be in Serbia in notime! 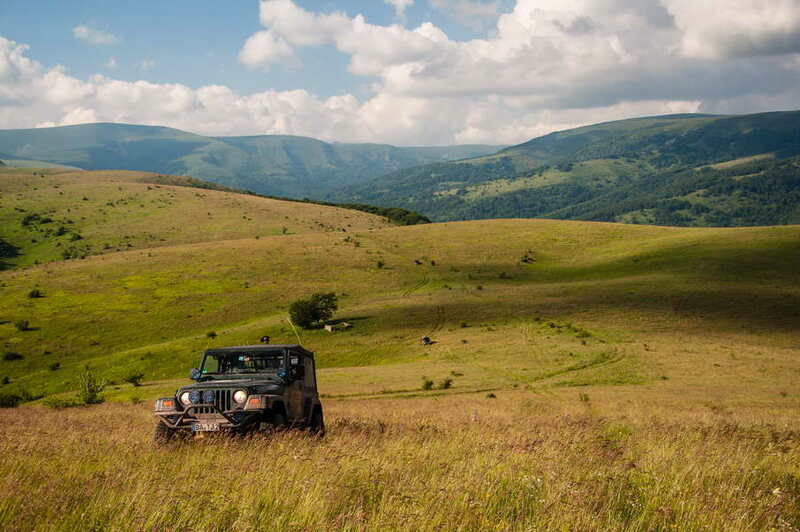 Serbia is just as close to western Europe as Romania, and closer than Albania or Greece, which are popular 4×4 destinations. It’s well worth the effort of a day’s drive to spend a week or two in the majestic Serbian scenery. I’ve heard that Serbia has bad fuel quality… What if I damage my engine there? Stories about “bad fuel quality” can be often heard, but are NEVER substantiated by any evidence. Every time an independent lab tests fuel quality in Serbia, they come up with results that prove that it is up to European standards. Anyway, people in Serbia also buy and drive modern cars with sensitive engines, and have no fuel issues nevertheless. How much Serbian money will I need and where do I get it? What if I get ripped off with the exchange rate? Relax… You’re not going to some canibal tribe, but to a normal, modern European country, where the financial system works just the way you’re used to at home. That means that you can pay with all major credit / debit cards either for fuel, food or accomodation, needing almost no cash at all. You’ve got ATM machines everywhere a bank can be found (and even outside banks in tourist resorts). If you do want to exchange some “solid”, paper Euros for RSD (Serbian dinars), it is best to do it in the official exchange offices which can be found in every Serbian town – they will give you better exchange rate than either banks or hotel reception desks (the difference between the buying and selling rate is in the range of 2%). So, those were the 10 most frequent issues that keep people away from Serbia. Still not convinced? Read what the visitors of Rustika Travel tours say in their own words about their experience. And don’t hesitate to leave a comment on this post, or write me an e-mail – I’d be glad to answer additional questions! The very interesting ones may be used for an update to this article. Previous Post4×4 tours for everyone – pick your own!Next PostDobrodošli u KAUP 4×4!